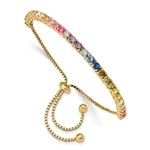 This collection of ladies' tennis bracelets is the logical choice for the women who value beauty and adornment. 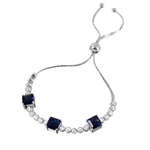 Our faux diamond and gemstone bracelets are the perfect gifts to make your significant other feel special. 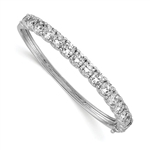 With a large selection of various styles to choose from, you are sure to find the perfect diamond tennis bracelet. Whether you're looking for a monochromatic diamond color scheme or a combination of diamonds and other precious stones, we have bracelets that meet the demands of any fashionista. 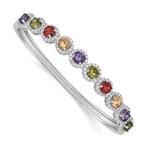 The bracelets are set in platinum plated sterling silver with a variety of stones including diamonds, amethyst, ruby, and citrine. Whether you are on a budget or ready to splurge, our collection of faux diamond and gemstone bracelets feature bracelets for every budget. 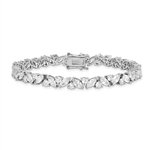 Ladies' tennis bracelets make excellent gifts for birthdays, weddings, bat mitzvahs, Valentine’s Day, Christmas, and hanukah among other special occasions. Currently, there is a selection of faux diamond tennis bracelets for under $120 each. This incredible savings makes precious gemstones affordable for the special lady in your life. Need help selecting the perfect bracelet for you or your loved one? Give us a call toll free, at 1-800-909-2525 or email at info@diamondessenc.com. Free & fast shipping available!